Department of Biopharmaceutics and Clinical Pharmacy 1, School of Pharmacy, the University of Jordan, Amman, Jordan. School of Pharmaceutical Sciences 2, Universiti Sains Malaysia, Penang, Malaysia. ABSTRACT: Background: Major orthopedic surgeries are divided into 3 major surgeries: total or partial hip replacement (TPHR), total knee replacement (TKR), and hip fracture surgeries (HFS), these surgeries are considered as high-risk surgeries for the development of venous thromboembolism (VTE) which includes deep vein thrombosis (DVT) and pulmonary embolism (PE). In general there are several factors that increase the VTE risk post these surgeries, this study was carried out to figure out the effect of the following factors on the VTE rate post these surgeries: age, gender, type of anesthesia, admission days before surgery, duration of hospital stay, duration of surgery, co-morbidities, the presence of any other VTE risk factors and the type of orthopedic surgery, at Jordan University Hospital (JUH). Methods: This was a prospective observational study; it was carried out at JUH. One hundred and seventy patients were enrolled in the study. A follow-up period up to 35 days was used starting from the surgery date. As extended VTE prophylaxis, 31.8% (54/170) of patients have prescribed Enoxaparin 40 mg daily, while 68.2% (116/170) were prescribed aspirin 325 mg daily. Results: In the Jordanian population, the incidence of symptomatic VTE after major orthopedic surgery was high (8.82%). The highest VTE risk was seen in HFS (P-value of 0.05 for PE, and a P-value of 0.001 for DVT). Factors that associated positively with VTE events are age, type of anesthesia, admission days before surgery, duration of hospital stay, co-morbidities and the presence of any other VTE risk factors. Discussion: It should be indicated that this suggested risk stratification sheet for orthopedic surgeries needs validation to prove its effectiveness, and this, in turn, needs another future study. Conclusion: VTE incidence rate in Jordanian population is high due to the known contributing factors; thus modification in the procedure used should be applied to reduce this high VTE incidence rate. So the author suggested risk stratification sheet according to the positive associations shown in this study. INTRODUCTION: Patients undergoing high-risk orthopedic procedures, specifically, THR, TKR, and HFS, have a significantly increased risk of VTE, with rates historically estimated at as high as 60% without appropriate prophylaxis 1. Rates of deep vein thrombosis (DVT) in total knee arthroplasty can be as high as 88% when untreated 2. In the last ten years, there were significant changes in the delivery of orthopedic services 3. The implementation of strategies such as day surgery admission and the use of spinal anesthesia resulted in a reduction in operating times, also the proper analgesia which allow early mobilization and aggressive rehabilitation, resulting in a mean length of hospitalization of five days. These strategies contribute to decreasing the risk of death in the perioperative period 4. Nowadays, patients routinely can walk using a walker within 24 h of surgery 5. There is no test to reliably assess individual VTE risk. Thus, the assessment is based on the identification and consideration of risk factors related to exposure (a type of surgical procedure/trauma/ acute disease, the extent of immobilization) and disposition (individual inherited and acquired elements) 6. METHODOLOGY: This is an observational prospective study; all of the patients that underwent THR, partial hip replacement (PHR), TKR or HFS at the JHU between the period of October 2014 and March 2015 were approached. The study was approved by the Institutional Review Board (IRB) of the JUH. Clinical Setting: After attending the morning management round at the orthopedic surgery ward, patients underwent any of the included surgeries were selected, and their files were checked. Once the target patients were known to the researcher, they were invited to participate in the study. Those who agreed to participate in the study were administered an informed consent form (ICF), in which everything about the study was explained. Once the consent was obtained, a data collection sheet was used, and a follow-up 35 days post operation was started. During the follow-up period, any readmission for the patients was recorded, and the reason for admission was documented. At the end of follow up period, each patient was called by phone to check the incidence of any complications, and the patients' adherence for the prescribed VTE prophylaxis agent was checked. It should be noted that many patients were seen in the orthopedic outpatient clinic several times during this period. Inclusion Criteria: Male patients aged 40 years or older and female patients aged 30 years or older, who underwent one of the following surgeries: THR, PHR, TKR, or HFS, prescribed aspirin or Enoxaparin as VTE extended prophylaxis post operation and agreed to sign the ICF. Exclusion Criteria: Patients are receiving anti-coagulant for treatment, patients with the spacer in between the surgeries (Antibiotic-coated spacers), and bilateral procedures. The data were analyzed using SPSS (version 20) at a significance level of (0.05). Descriptive analysis like sample means, standard deviation, frequencies, and percentages was conducted. Continuous variables were presented as mean ± standard deviation (SD). Chi-square test and ANOVA were used to determine whether there are any significant differences between variable groups. Post hoc test (Bonferroni and Tukey test) were used to compare between groups to the exploration of the differences among them. RESULTS: The number of patients eligible for the study was 187 (the response rate was 90.9%). The follow up were lost with 2 patients, the surgery was postponed for 6 patients due to unstable vital signs, and it was canceled for 4 patients due to different reasons, while 5 patients refused to sign the consent form. The number of patients who granted informed consent was 170 patients. 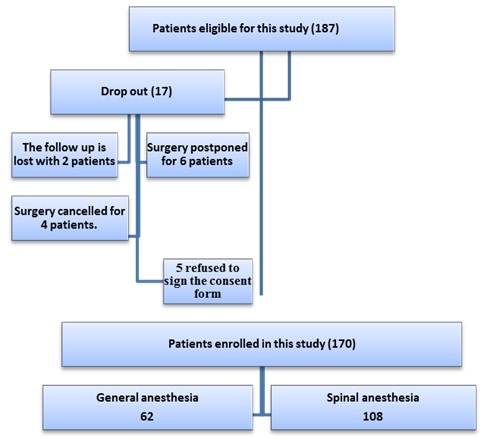 Patients underwent three types of surgeries under general or spinal anesthesia according to the flow chart Fig. 1. Patients' Characteristics: Patients were recruited between October 2014 and March 2015. A total of 170 patients were enrolled. The mean age of these patients was 65.64 ± 11.81 with a significant difference between HFS and the other two groups (TKR and TPHR). HFS patients had a higher mean age (P-value 0.001). Seventy percent (119) of patients were females; with a significant difference favoring female in the TKR group in comparison with the other two groups (P-value 0.001). The mean BMI was 31.46 ± 7.0 kg/m2, with a significant difference between the TKR group and TPHR (P-value of 0.002). From these patients 92.5% were insured, 60.7% had restricted lifestyle, 39.3% normally had active lifestyle. Most of the patients' family history was negative for previous VTE events (99.4%). The general characteristics of patients having different orthopedic surgeries are listed in Table 1. BMI = Body mass index, Freq = Frequency, HFS = Hip fracture surgery, SD = Standard deviation, TKR = Total knee replacement, TPHR = Total or partial hip replacement, VTE = Venous thromboembolism. *Means or frequencies. To test the difference between continuous variables, ANOVA test was used, and a Tukey test was performed to make the mean separation. The Chi-square was conducted to test discrete variables (frequencies), and Bonferroni test was performed to compare between variables proportion. **Means or frequencies with the same letter (an orb) were not significantly different, while means or frequencies with different letters were significantly different. ***Lifestyle: restricted means are always sitting, normal means everyday life activity and highly active means exercising on a daily basis. CKD = Chronic kidney disease Cr = Creatinine, CVA = Cerebrovascular accidents, DM=Diabetes mellitus, HFS = Hip fracture surgery, HTN = Hypertension, IHD = Ischemic heart disease, INR = International normalized ratio, MI = Myocardial infarction, OA = Osteoarthritis, Plt = Platelets, RA = Rheumatoid arthritis, SD = Standard deviation, TKR = Total knee replacement, TPHR = Total or partial hip replacement, VTE = Venous thromboembolism. *Means or frequencies. To test the difference between continuous variables, ANOVA test was used, and a Tukey test was performed to make the mean separation. The Chi-square was conducted to test discrete variables (frequencies) and Bonferroni test was performed to compare between variables proportion. **Means or frequencies with the same letter (a or b) were not significantly different, while means or frequencies with different letters were significantly different. *** Risk factors were assessed by using a data collecting sheet. Most commonly reported medical conditions for patients were as the following: 62.1% had hypertension, 32.5% diabetes, 42% osteoarthritis. Regarding risk assessment, 2.4% of patient had moderate VTE risk factors (ranging between congestive heart failure and chemotherapy use), and 68.9% had weak VTE risk factors (ranging between obesity, varicose veins or increasing age), while 14.25% had at least one risk factor for bleeding Table 2. Surgical Procedures and Treatment from Admission to Discharge: Almost half (47.1%) of patients underwent TKR. Operations were conducted mainly under spinal anesthesia (63.5% of patients). The mean duration of all surgeries was 1.9 ± 0.55 h, with a significant difference between TPHR and HFS (P-value 0.022). The mean number of days from admission to surgery was 2.03 ± 2.7 for all surgeries, with a mean of 9.18 ± 6.28 total duration of hospital stay for all patients, with a significant difference between TKR and TPHR (p-value 0.005). The most commonly used analgesic was pethidine (70.5%). Preoperatively, most patients were given enoxaparin as VTE prophylaxis (98.0%), and it was continued postoperatively till discharge. AB = Antibiotics, DHS = Dynamic hip screw, DM = Diabetes mellitus, HFS = Hip fracture surgery, HTN = Hypertension, ORIF = Open reduction internal fixation, PPIs = Proton pump inhibitors, SD = Standard deviation, TKR = Total knee replacement, TPHR = Total or partial hip replacement, UFH = Unfractionated heparin, VTE = Venous thromboembolism. *Means or frequencies. To test the difference between continuous variables, ANOVA test was used, and a Tukey test was performed to make the mean separation. The Chi-square was conducted to test discrete variables (frequencies), and the Bonferroni test was performed to compare between variables proportion. **Means or frequencies with the same letter (a or b) were not significantly different, while means or frequencies with different letters were significantly different. Upon discharge, the patients either continued LMWH (31.8%) or were given aspirin as extended VTE prophylaxis (68.2%) after being on LMWH for a mean duration of 6.4 ± 4.59 days Table 3. As seen in Table 3, all patients were given PPIs, an analgesic, antibiotic, and anticoagulant, in addition to medications prescribed for their medical conditions. Recovery and Physiotherapy Post Operation: The majority (72.9%) of patients started to walk using a walker within 24 h of the surgery, with a significant difference favoring early mobility in TKR more than the other types of surgeries (P-value 0.001) Table 4. Patients were using the walker for a period of 32.6 ± 9.32 days postoperatively; only 2.2% used crutches after 1week post operation. Using a pain scale for pain assessment, the most painful surgery was TKR with a mean of 8.88 ± 1.09 score. Pain score was significantly higher for TKR than the other types of surgeries (P-value 0.001). This pain was continued for a mean period of 31.5 ± 6.01 days. HFS = Hip fracture surgery, SD = Standard deviation, TKR = Total knee replacement, TPHR = Total or partial hip replacement. *Means or frequencies. To test the difference between continuous variables, ANOVA test was used and a Tukey test was performed to make the mean separation. The Chi-square was conducted to test discrete variables (frequencies), and Bonferroni test was performed to compare between variables proportion. **Means or frequencies with the same letter (a or b) were not significantly different, while means or frequencies with different letters were significantly different. VTE Incidence Rate Post Surgeries According to Surgery Type: In this study, the incidence of symptomatic VTE after major orthopedic surgery was high (8.82%), Table 5 summaries all complications. The rate of symptomatic DVT was 0% for TPHR, 1.3% (1/80) for TKR, 14.7% for HFS and as overall for DVT risk 3.5%. The rate of death (reported for all cases within 14 up to 21days post operation) was the highest post-HFS. The highest VTE risk was seen in HFS (P-value 0.05 for PE, and a P-value 0.001 for DVT). The frequency of PE after TKR was 1.3% (1/80), after TPHR 7.1% (4/56) and after HFS 11.7% (4/34). DVT = deep vein thrombosis, HFS = hip fracture surgery, PE = pulmonary embolism, SD = standard deviation, TKR = total knee replacement, TPHR = Total or partial hip replacement. *Means or frequencies. To test the difference between continuous variables, ANOVA test was used, and a Tukey test was performed to make the mean separation. The Chi-square was conducted to test discrete variables (frequencies), and Bonferroni test was performed to compare between variables proportion. **Means or frequencies with the same letter (a or b) were not significantly different, while means or frequencies with different letters were significantly different. The Effects of Anesthesia Type: This study investigated the value of special anesthetic procedures, especially spinal anesthesia in orthopedic surgery and discussed their impact on several postoperative outcomes, whether spinal anesthesia decreases mortality, DVT or PE. A significant association was noted in the duration of surgery between the two groups of spinal and general anesthesia with longer duration seen in the group of general anesthesia (P-value 0.029); Table 6. There was a significant association between the type of anesthesia and the incidence of PE, with 7 cases of PE (total 9 cases PE) occurring in the general anesthesia group (P-value 0.01) Table 6. DVT = Deep vein thrombosis, Freq = Frequencies, PE = Pulmonary embolism, SD = Standard deviation. *Means or frequencies. To test the difference between continuous variables, ANOVA test was used, and a Tukey test was performed to make the mean separation. The Chi-square was conducted to test discrete variables (frequencies), and the Bonferroni test was performed to compare between variables proportion. **Means or frequencies with the same letter (a or b) were not significantly different, while means or frequencies with different letters were significantly different. Association between VTE Risk Factors and the Occurrence of VTE Events: As seen in Table 7 there is a significant association between the incidence of PE and VTE risk factors. DVT = Deep vein thrombosis, Freq = Frequencies, PE = pulmonary embolism. * Chi-square was conducted to test discrete variables (frequencies) and Bonferroni was performed to compare between variables proportion. **Means or frequencies with the same letter (a or b) were not significantly different, while means or frequencies with different letters were significantly different. Association between Duration of Hospital Stay with VTE Events: There was a significant relationship between the occurrence of PE and the duration of hospital stay with a mean value of 14 ± 7.17 days (p-value 0.015); Table 8. DVT = deep vein thrombosis, PE = pulmonary embolism, SD = standard deviation. *To test the significance between continuous variables, ANOVA was used and Tukey test was performed to make the mean separation. The relationship between Admission Days before Surgery and VTE Events: An admission day before surgery was also a contributing factor in increasing VTE events. There was a significant relationship between the occurrence of PE and DVT Table 9. For patients who had PE the mean for days before surgery was 3.8 ± 2.7, while for DVT it was 6.16 ± 11.7. Association between Patients' Co-morbidities and VTE Events: There was a significant relationship between CVA (P-value 0.048) or IHD (P-value 0.015) and the occurrence of nonfatal PE. Furthermore, a significant association was found between chronic kidney disease (CKD) and DVT (P-value 0.045); Table 10. CKD = Chronic kidney disease Cr = Creatinine, CVA = Cerebrovascular accidents, DM=Diabetes mellitus, HFS = Hip fracture surgery, HTN = Hypertension, IHD = Ischemic heart disease, MI = Myocardial infarction, OA = Osteoarthritis, PE = Pulmonary embolism, RA = Rheumatoid arthritis, SD = Standard deviation, TKR = Total knee replacement, THR = Total hip replacement. * Frequencies. The Chi square was conducted to test discrete variables (frequencies) and Bonfferoni test was performed to compare between variables proportion. Association between Duration of Surgery and VTE Events: As seen in Table 11, there was no significant relationship between the duration of surgery and VTE events. The relation between Age and Complications: In this study, most complications were seen above age 60. Table 12 with a significant difference in PE between under 60 years group and above 80 years group. Association between VTE Events with Gender: The frequencies of VTE events were higher in the female, but p-value was not significant as seen in Table 13. DVT = Deep vein thrombosis, PE = Pulmonary embolism. *Frequencies. Chi-square was conducted to test discrete variables (frequencies), and Bonferroni was performed to compare between variables proportion. **Frequencies with the same letter (a or b) were not significantly different, while means or frequencies with different letters were significantly different. DVT = Deep vein thrombosis, Freq = Frequencies, PE = Pulmonary embolism. * Chi-square was conducted to test discrete variables (frequencies) and Bonferroni was performed to compare between variables proportion. The lifestyle of elderly in Jordanian population (The mean age in this study was about 65 years), which can be described as a sedentary lifestyle; as shown in this study (60.7% of patients have restricted activity). Furthermore, the high BMI was seen in the majority of patients (BMI mean 29.3 ± 10.4). These factors may have contributed to increasing risks and as consequent increasing VTE events. The duration of hospital stays: there was a significant association between the duration of surgery in patients receiving spinal and general anesthesia with longer duration seen in the group of general anesthesia (P-value 0.029). Furthermore, the longer duration was associated with higher VTE risk. An association was also noted between VTE events and the duration of hospital stay, where the occurrence of PE was related to longer duration of hospital stay (P-value 0.015). An admission day before surgery was another contributing factor for VTE events. An association between admission days before surgery and VTE events showed a significant relationship between the occurrence of PE and DVT. Patients' in compliance for their VTE prophylaxis regimen could be an additional contributing factor. Most patients requiring surgery had co-morbidities that may have caused them to be immobile or inactive. Also after most types of surgery, most patients experienced a period of bed rest and immobility. Traction and plaster cast further reduce postoperative movement, and all these factors lead to venous stasis and an increased likelihood of thrombosis. Direct vascular damage can be significant. For example, in TPHR surgery, there may be kinking or twisting of major veins, which can predispose the patient to postoperative VTE. Pelvic or HFS surgery also carries a high risk because of the pressure on large veins during the dissection. All operations involve a degree of tissue damage; activated coagulation factor levels in blood following surgery will be high. The more extensive the damage, the more likely is the activation of coagulation; and the higher the VTE risks. Duration of surgery, the longer an operation is, the greater the risks and patients undergoing surgery lasting more than 30 to 45 min are considered at risk 7. In this study no significant relationship was seen between duration of surgery and VTE events, this could be attributed to the fixed duration of surgery for most patients since we have almost the same surgeon, as well as the sample size, was not enough for this relationship to be clear. Recent studies have also suggested that the type of anesthesia employed can influence the degree of thrombosis risk. Spinal and epidural anesthetics seem to be less thrombogenic than general anesthesia 6. In this study, there was a significant association between type of anesthesia and the incidence of PE, with 7 cases of PE (from total 9 cases PE) occurring in the general anesthesia group (P-value 0.01). CONCLUSION: As a conclusion, VTE incidence rate in Jordanian population is high due to the known contributing factors; thus a procedure modification that will reduce this high VTE incidence rate is needed. Such as the application of preadmission clinic as well as the use of suggested VTE risk stratification sheet (see Table 14) which is suggested by the author depending on all the above-studied variables and their associations, to do a risk assessment for each patient and prescribe the appropriate VTE prophylactic agent. Indeed, another study is needed to validate this suggested VTE risk stratification sheet. Limitations: The weight (kg) and height (cm) are essential to calculate BMI; despite this, the majority of patients' files are missing these two critical parameters. As a result, the data was obtained by either directly asking the patient or by estimations. This is an observational study without any intervention or randomization. Some of the patients' phone numbers listed in the JUH computers were not working, so the follow up was lost with two patients. Calling patients to follow up was not covered financially. Geerts WH, Bergqvist D, Pineo GF, Heit JA, Samama CM, Lassen MR and Colwell CW: Prevention of venous thromboembolism: American College of Chest Physicians evidence-based clinical practice guidelines. Chest 2008; 133(6): 381S-453S. Mistry DA, Chandratreya A and Lee PY: A systematic review on the use of aspirin in the prevention of deep vein thrombosis in major elective lower limb orthopedic surgery: An Update from the Past 3 Years. The Surgery Journal 2017; 3(04): e191-e196. Jameson SS, Baker PN, Deehan DJ, Port A and Reed MR: Evidence-based for aspirin as venous thromboembolic prophylaxis following joint replacement. Bone Joint Res 2014; 3(5): 146-9. Malviya A, Martin K, Harper I, Muller SD, Emmerson KP, Partington PF and Reed MR: Enhanced recovery program for hip and knee replacement reduces death rate. Acta Orthop 2011 ; 82(5): 577-81. Khan SK, Malviya A and Muller SD: Reduced short-term complications and mortality following Enhanced Recovery primary hip and knee arthroplasty: results from 6,000 consecutive procedures. Acta Orthop 2014; 85: 26-31. Encke A, Haas S and Kopp I: The prophylaxis of venous thromboembolism. Deutsches Ärzteblatt International, 2016; 113(31-32): 532. Hull RD, Raskob GE, Hirsh J, Jay RM, Leclerc JR, Geerts, WH and Gent M: Continuous intravenous heparin compared with intermittent subcutaneous heparin in the initial treatment of proximal-vein thrombosis. New England Journal of Medicine 1986; 315(18): 1109-1114. Alamiri M, Albsoul A and Alajlouni J: Suggested venous thromboembolism (VTE) risk stratification sheet for orthopedic surgeries. Int J Pharm Sci & Res 2019; 10(4): 1660-69. doi: 10.13040/IJPSR.0975-8232.10(4).1660-69. Authors Address: Department of Biopharmaceutics and Clinical Pharmacy, School of Pharmacy, the University of Jordan, Amman, Jordan.